Patti, happy to inform you that we have returned from our trip and we began our next batch of enrolment of new Universal Living Rosary Association of Saint Philomena (ULRA) members today. So grateful to inform you that, yesterday both your nice boxes posted through UPS EXPRESS SERVICES on February 19th were received at our office door with a joy you will never never realised. Thank you very much for your quick response and for the beautiful Rosaries, Miraculous Medals, Scapulars, Calendars, Large Holy Pictures, Spring 2010 Dedicated Decades, Holy oil and the beautiful crucifix. So glad to see our photos and my letter featured in this new Dedicated Decades, spring 2010. It is indeed very interesting and I hope our members at St. George's Parish would feel proud of your wonderful work and they would be much encouraged. Thank you also for the copies of the very short biography of our dear late Rev. Sr. Mary Francisca. We shall continue to remember her repose soul in our prayers and Holy Masses, so take courage!! 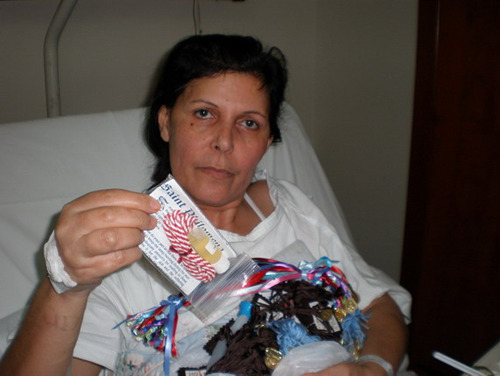 Patti, we hope to enrol so many new members every month, so we may need so many more Rosaries in all your future Airlifts so that we can accomplish the work. Patti, now our country is running into ditch. Prices of essential commodities and petroleum are so much increased. Just about two weeks ago. Some taxes and Bills have been increased by over 300%. How can we live? I know it is critical moment for the whole world but what has started here in Ghana is indeed much unbearable. In fact we badly need prayers. Patti, Thank you so very much for all your constant support and prayers. It is our prayers that the Almighty God may reward you a million times. Peace be to you!! I send you now the photos of the women who was healed miraculous by the intercession of Our Lady of Mount Carmel and Saint Philomena Our lovely Saint, you will see in the photos, the women who is call: Marie el Hachem who is cured miraculous, now she is fine after a very dangerous surgery in her head, she had a cancer in her head. I keep you in my poor prayers, I still pray to the soul of your dear sister Mary Francesca, and to your dear mom, your dear staff, our dear benefactors, espacialy Mr. Dr. Thomas and all his dear family. Universal Living Rosary Association of Saint Philomena (ULRA), Pakistan Center, Newsletter, January – March, 2010. I was not at the center since 4 days, now I just coming. I have a very big miracle did by Saint Philomena Our patroness, to a Lebanese lady who is married and have no children. 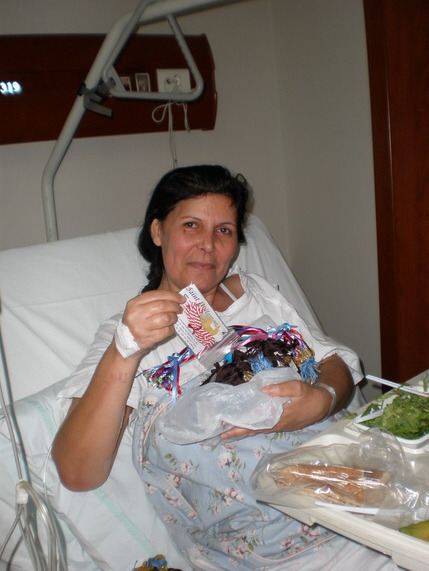 So she was an cancer ill and was very sick and her life was in very big dangerous, so when I met her ,since one year ,I gave her the oil ,the cord, and the Scapular of Our lady, of course she became with her husband a members in the Living Rosary and the Scapular Brown, she had a big trust and refuge to Our Saint and Our Lady of Mount Carmel, she had so many treatment of chemotherapy of the cancer ,she has the cancer in her blood and after in her head, in the hospital, they did a dangerous surgery in her head ,since 2 weeks, so in this time I pray to her Our Lady and Saint Philomena, and I put her life in their hands, and I believed that she will not survive anymore because of her situation who is very impossible, but after the surgery ,I asked about her and they told me that she is okay, and her life is saved by a miracle. So I returned to Our Lady and Saint Philomena to give to them my thanks and my prayers of thanksgiving for this big miracle, so I visited this women at the hospital before the surgery and took to her some photos to give to you very soon, her name is: Marie al hachem .now I want to visit her after the surgery and take to her some photos, with her family. Now this women promised Our Lady and Saint Philomena ,to be their servant and preach about them to everyone she meets ,during her life, so I gave her some Sacramentals to distribute first to her family and parent and after ,when she will very good ,she will visit the homes and the schools ,hospitals and preach about Our Lady and Saint Philomena. I still pray to the soul of your dear sister and our dear sister too, Sister Mary Francesca, I am sure she is a Saint in the heaven, and I pray to Her to take her intercession and to help here in my work and our work, I feel that she is now near of us and help our walks in this difficult life to lead us more better to Our Lady and Our Lord Jesus Christ, I pray also to your dear Mom Mrs. Dorothy ,may Our Lady give her the patience and the consolation to this very big lost of her beloved daughter sister Mary Francesca. I keep you in my poor prayers, also our dear benefactors, all your dear staff and all the members of the Living Rosary. Warm greetings from Goroka in the Eastern Highlands Province of Papua New Guinea. I was delighted to receive your most welcome letter, St. Philomena chaplet, the Blessed Oil of St. Philomena, St. Philomena cord, Rosary beads and devotional literature of The Universal Living Rosary Association. God bless you for your care and kindness. I have distributed them amongst the parishioners of our parish. Several parishioners of our parish, Mary Help of Christians, have requested a small bottle of The Holy Oil of Saint Philomena and the St. Philomena cord. To my surprise and delight one of those parishioners, Michael, produced a crumpled holy card of St. Philomena. The title and prayers of the chaplet of St. Philomena on the card were written in ‘Pidgen English’ – Santu Philomena, Was-Santu Bilong Living Rosary …. (St. Philomena, Patroness of The Living Rosary), Santu Philomena, Was-Santu Bilong Ol Pikinini Bilong Santu Maria (St. Philomena, Patroness of The Children of Mary) and Pre B’Long Helpim Mipela (Pray for us). If you are able to donate several bottles of The Holy Oil of Saint Philomena, the St. Philomena cord, and the holy cards of St. Philomena written in pidgin English I would be most grateful. When the small bottles of Holy Oil of Saint Philomena, the St. Philomena cords, and the holy cards of St. Philomena arrive I will give them to these parishioners. On their behalf I offer you our gratitude and a remembrance in our prayers. I am a Christian Brother (Irish Christian Brothers) ministering as a pastoral carer to our brothers and sisters who suffer from a mental illness. Part of my ministry is also assist and share in training programs for Papua New Guineans in the care and treatment of persons with a mental illness. We are also developing a mental health program in the local and rural communities and already good things are happening, thanks be to God. We appreciate and value your prayers. May the peace of our Lord Jesus Christ be with you!!! I was watching the news on single engine plane crashed in Austin Texas and am wondering how far are you from the incident site? Hope you are all well. I took 6 weeks break from work and spent allot of time packing sacramental gifts for some 1,000 plus Universal Living Rosary Association of Saint Philomena (ULRA) members. I completed half of the work and stopped because I have no more Rosaries, MMS left. I still have a lot of Registration/membership cards in stock. What I need now are Rosaries and MMs. I am slowly filling in new forms to post the list I have completed plus new ULRA members list. My friend who was good helper to me is now working so I am behind with posting. The Lord is good providing us with all the help. I still mange with small petty cash I established to assist me with postage and transport allowance for those helpers who come to pick gifts for distribution. I am praying for all our financial help. Pray the Rosary daily booklet is well appreciated over here by our members as they use them in other liturgy groups at Parishes level. Our ULRA work through my group has spread to 11 Provinces and we have 22 Provinces in PNG. I am thinking of retiring from public service early so I can place some valuable time doing ULRA work. ULRA through St. Philomena’s intercessions providing blessings for our member’s example husbands returning to their wives and children, employment for unemployed people, healing for the sick using St. Philomena’s Oil and Cord and other miracles praying the Holy Rosary for difficult situations. Evan a relative who is a Carmelite nun is asking me to provide her Rosaries so she can help distribute them out. At one of our national Priest ordination, I spoke to one other num in another Province to consider finding a lay person to become a promoter in her Province. Besides that I manage to get Rosaries and MMs to other 11 Provinces. Thank you very for keeping our URLA work going around the Globe. May God bless all the benefactors and you doing what our Holy Mother Mary is calling us all to pray the Rosary! Yours in the name of Holy Mother Mary!!! I received the parcel with the rosaries and magazines. My grateful thanks. Could you very kindly send me St. Philomena cords at your earliest convenience? Dengue fever is spreading in the village and the St. Philomena cords are very essential. Many cases were healed after tying these St. Philomena cords you sent me earlier. These are urgently required. With our prayers and God’s blessings. EYE WITNESS REPORT: SUDAN PRE-ELECTION JOIN ME TODAY, I AM WAITING! SUPPORT ME! I am eternally grateful to the benefactors and Mrs. Patti Melvin, for the moral and financial support that has enabled a successful return to the war-ravaged South Sudan! On Friday - 11th December, I arrived at the dusty South Sudan international airport. I had all that I needed to start with the challenging mission. My first assignment was to oversee delivery of two large boxes with 40,000 Miraculous Medals and St. Philomena oils to the Darfur region! There is no clear route to achieving this; the first delivery was successful because we used a series of mechanical measures and delivered through collaboration with the strictly monitored U.N. staff; it is only in Rumbek where such arrangement could be made. This time, I had to reach with another dispatch to the zealous Angela. She has offered her life and time despite communication constraints, to work for Mother Mary; she finds the MM effective, to protect the vulnerable and she continuously nurses with the oils, those injured by “righteous” pro-government Janjaweed Islamists after their “holy wars” against a defenseless population. The Miraculous Medal is effectively protecting a big percentage of the defenseless population (Moslems and Christians), from the injurious tortures! The injured population is effectively consoled by administering the holy oil and treating septic wounds. Religious operations are dangerous in Darfur, practically non-existent because the Islamists set dangerous rules that favour the promotion of Islam only! Courageous Angela’s overflowing zeal shakes off all these fears; she only needs our support to continue the good work! 16th December went well with us, a breakthrough date when the second ever successive delivery reached Angela along an arduous route. Thanks be to God! Upon my arrival in Yei, I was welcomed in a fashionable style; first by the bishop to whom I presented ULRA's donated cassocks, then, the zonal catechist leaders who were at the monthly meeting. They decided I would visit with the Fatima Message the extensively separated rural chapels so as to widen the ULRA “decadescape”! During the civil war years, the Church was disabled and millions of her faithful were killed or displaced to neighbouring countries; it created a generation of people without the basic religious instructions! January-2005 fragile peace accord with the Islamist North ushered in relative peace that saw a massive return of the miserable from exile; unfortunately, their expectations were short-lived and now their trust is eroded. Ignorance of God’s work is rampant and compounded by the abnormal high Christian/clergy ratios in the geographically vast parishes! Parishes are divided into zones; a zonal head catechist oversees the catechesis of the respective zone through chapel catechists! Church personnel is ill equipped despite painful struggle to help the war traumatized generation to recover to normality! The Sacraments are vital parts of spiritual nourishment and, sadly, they are nearly non-existent. A large percentage of the faithful has never seen a visiting priest to their village chapel while another same similar number waits for nearly two years to see the parish priest who at the same time works as his own curate! A big percentage of little educated and poorly equipped catechists teach memorized catechism; nonetheless, they are substantial church pillars. They have enormous ignorance of the Rosary!!! It is in this rich soil of ignorance that ULRA’s indispensable mission is being firmly planted and is well felt because of its contribution to vigorous grass-root evangelization, sacrificing time, energy and life for the sake of Mother Mary! Yei is the smallest diocese by Sudan standards with estimated 460,000 square miles that are covered by seven parishes only! I decided to work in one parish and was deafened by the enormous calls from other parishes. Christ the King Cathedral Parish, itself the size of a diocese in a country elsewhere, has 17 vast zones with 97 chapels; it would take the entire 3 months’ stay to cover it! Zonal leaders actively helped me to choose the chapels of visit. Gnawing crushing poverty is visibly clear as one approaches the villages. There is large scale destruction- deforestation. The dusty roads are usually lined by mothers and children with water drawing containers! Sudan’s semi-arid zone lacks natural reservoirs. Audiences were always interested in learning the basics of the one Apostolic Church. Catholic action members are only entangled in cleaning and arranging the log seats in the church for Sunday services, ignorant of the prayer obligation. Many of those I came across had never heard about the Rosary! God endowed me with health that enables me with a specific teaching plan and, undoubtedly, it brings forth dividends! I have tirelessly managed to visit 5 centres where I have used simple, kind and straight forward language to accommodate the understanding of the FATIMA MESSAGE by everyone present! Several catechist translators have been by my side; however, my struggle with poor Arabic language has amused many who came to see me! I remained steadfast with the prime subject. My enormous wide knowledge from ULRA literature spiced with the physical experiences from the missions elsewhere throws in great hope and makes the moving talks thrilling for the poor souls! 1. Evenings – I arrive at the centre to be in time for the talks of the following day. a hired motorcycle to the next centre. The biblical writings on the Marian prayer and other well searched writings have been strong eye openers for those who had been confused by a specific sect! A sort of miracle, attentive undisturbed seating for long periods showed me that everyone wanted to quench the spiritual thirst that has accumulated over the civil war years! The young and old showed disappointment at the slightest disruption of the talk and many came from very far places, beyond 30kms on bicycles! At one centre, many tears were shed in pleading! Since return from exile in 2005, none of the clergy had ever turned up to teach this important prayer and that of the Way of the Cross at Nyapea centre! The Rosary Decade is transforming people’s lives! I have made it a point and taught the proper way to pray the Rosary! I gave the audience appropriate prayer plan of the simple but powerful Decade of the Rosary as a daily minimum and this has been well marked by everyone that attended! The history of the priceless Miraculous Medal has likewise interested the audience with penetrating eagerness! Encouraging experiences from Darfur and Congo were good lessons to a people that had been scandalized by wide ignorant use of satanic bangles and necklaces of the Chinese origin! Thanks to the benefactors, we have now replaced thousands of these with MM. Mothers have totally got rid of the fetish materials from their families. The stubborn youth age that, at times, proves hesitant to act, surprisingly got rid of the satanic tags and replaced them with MM! The apostolate is not without unusual problems; in the case of Sudan, they are dangerous. Yesterday I witnessed with naked eye, a former rebel soldier that fought in the name of denied justice by the Islamists! He pulled out a bayonet and stabbed a poor driver of a ramshackle pickup for just a simple reason because he got in his way! This is only the tip of the iceberg, much goes un-noticed; ethnic fighting is fuelled and they are now heavier than ever before! On the other side, hunger and civil conflict continue un-noticed by the international community. Thank God for the ULRA’s spiritual role! Selfish Uganda customs authorities disrupted my programmed travels, and thus delayed my visit to the displaced Congolese population and eventual departure for the next mission in Wau. They withheld my airlift of supplies! God, however, enabled a way out; the boxes came up to me and I managed the visit! St. Philomena’s intercession saw a successful visit to the Congolese! Never before in my mission history had I met refugees with such great faith! Visiting them enriched my mission zeal! God’s providence exposed me to a people with strong faith despite forced displacement from their homes by Kony rebels’ atrocities! Ravaged by suffering, each of them looked happy at every inch of the body! I felt honored to deliver a talk about the Rosary to a respectful humble crowded audience and was extremely blessed to solve the Rosary problem they had for some time shared with the parish priest! Unlike their Sudanese Catholic counterparts, I never met anyone with satanic bangles around the body of any Congolese! With the help of the parish priest of the area where the refugee camp is located, I oversaw distribution of close to 15,000 MM and all the refugees broke into a nice melody that praised God and their benefactors! I left with 60 new enrollment groups and I left material for more when I came back! Thanks to the French literature, it excited everyone! I arrived in Wau on 8th February, important on the Sudanese Catholic calendar, the feast of St. Josephine Bakhita, a Darfurian! Wau diocese is placed at the north/south ideological and there I spent the rest of this mission time; however, I do call upon urgent assistance to help me send another MM dispatch to Darfur, then to Malakal and the conflicted Abyei! Tomorrow might be too late as you say! There are two Elections here, the first is in April and then a Referendum for the South in January 2011! Already the arms race has shaped up again and peace might backslide into total chaos! The struggle continues and the report is continuing! Thank you for the second package of materials you sent. I received them on Thursday February 4, 2010; I will distribute them at the Blue Army meeting next Thursday. Hopefully more people will get on board. Your materials are fantastic. You can send me anything you want I will definitely put all the material to good use and distribute them throughout the diocese of Rochester, New York. I appreciate this greatly. The world needs you more than you will ever know. God bless each and every one of you at the Universal Living Rosary Association of Saint Philomena (ULRA). I just arrive now from the Bicol region. I am really touched by the many WONDERFUL religious articles....they are very very very..............nice! I am happy for all those who will receive them. I will give the chasubles to our Indonesian sisters to bring to Indonesia...I will give some of the beautiful medals to the group of our lady of Fatima in our place in Cebu who are members of the Universal Living Rosary. The chains of St. Anthony are also marvelous! I will also distribute the stampita of the departed souls to the ULRA members so we can offer our prayers for them. How nice to keep and pray the different novena prayers of the saints....I will distribute the prayer for the priest to different parishes so we can motivate many to support our priest with our daily prayers. All the Rosaries will be given to a public school in Victoria, Laguna where our sisters are having catechism. And I will keep for me the native bag from Cameron, so beautiful! May God bless us all! May our loving Mother Mary guide us always. Briefly I wanted to thank you kindly for your parcel with much good information, and for the nicely packaged oil, Rosary, cordons and medals. I also wanted to ask you if the devotional items apart from the Saint Philomena Holy Oil, such as the cord, the medals, the Rosary, etc., have already been blessed. I thank you once again for your help, and I look forward to joining you in prayer. Good day! May God bless us all. Sorry for so busy getting schedules of schools having their activities in pupils who are receiving the first communion. So these are the times the white dresses are now worn by these children receiving the first communion. There are about six thousand names endorsed as new members in the Living Rosary for the reasons about people who told about their testimonies of the St. Philomena devotion and the living Rosary. Those who were not yet members wishes to become a member in the Living Rosary because through they are not yet a member, they already experienced how St. Philomena helped them. Typhoons forecast in our news bureau that is struck in our regions, but thanks God, Mother Mary and St. Philomena. Typhoons vanished away and no where! Again Hail to St. Philomena. By this time we need more registration numbers in the Living Rosary. People keep coming and endorsing more names. They are very interested to be a member in the Living Rosary. Wishing a Happy and Blessed day to all of you! We received already the forex box and other documents you sent a couple months ago. Our promoters and members are happy for the very beautiful rosaries and other usable materials that could help us to promote and spread the devotion of the Blessed Virgin Mary through the constant intercession of St. Philomena. I am going to out now the registration form to send at your office. And I am happy also to inform you that currently I received a request from three Parish Priests requesting to include their whole BEC members to the Universal Living Rosary Association of Saint Philomena (ULRA) but the problem is -- we cannot accommodate them all in one time, because we don’t have sufficient supplies of rosaries and guides for them. Each parish has almost 4,000 ULRA members as shown in their database. I told them to wait the rosaries coming from your office. I have already the lists of the BEC members each parishes and this will be transferred to the registration form prior to give them the ULRA membership card. I hope you can give us again more Rosary beads and guides for these people. They all hunger and thirst for the love of God and for the love of Mary and this is our great opportunity to take them all and bring them to Jesus through this devotion. I am a catholic priest ordained in 2004 in Mangochi Diocese, Malawi, in the Central part of Africa. I have followed the life of the Universal Living Rosary Association of Saint Philomena (ULRA). I have been very much convinced and impressed with the remarkable membership of the religious. For me, this is an indication of how transforming this association can become in ones spiritual life. To this effect, i would like to request your kind consideration on how i could become a member of the ULRA. I would be quite grateful if my request would be kindly considered. By Thy Immaculate Conception, O Virgin Mary, Counsel, Protect and Defend Us! It is with great sorrow, I share the sudden death of my little sister. This angel of mercy spent herself entirely. She helped everyone with everything, forever, without hesitation, and with never a thought of herself. She simply burned on and on, until she was totally burned out. She gave herself in love to all souls, generously and tirelessly, all for Jesus through the Immaculate Heart of Mary. 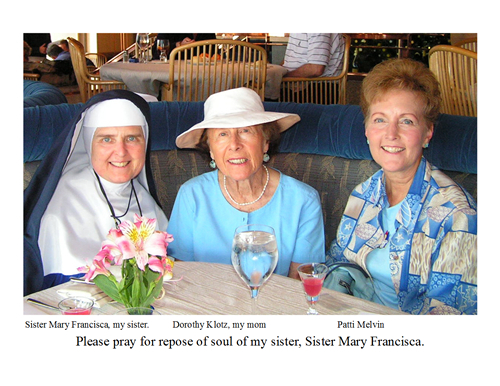 May Sister Mary Francisca rest in eternal peace! I have traveled to Idaho for the funeral and to spend ten days with my dear mother who is blind. Please pray for my mother, Dorothy Klotz, who is absolutely devastated by this loss. Sister did everything for mom. Thy outpouring of Sweetness and Strength! Only love can make a soul pleasing to God and nothing but love. All our words and works are nothing in His sight, unless we abide in Him and He in us. Prayer imparts to us His Spirit. Mary was the first living Pyx of Jesus Christ. In our godless world, full of ignorance and ambition, chaotic darkness enshrouds us and all is crumbling. The things and people in whom we have placed our trust have proved worthless reeds. Without God, we can do nothing! What is needed are many souls who will each be a true living Pyx in which Our Lord will find a home where He is cherished and loved, and from which He can emanate the sweet sunshine of His Adorable Presence. Mary’s children will be God-bearers bringing the Indwelling Presence of the Triune God into the world. Let us be that spiritual vessel united to Mary which brings Christ to a dying world. This can be accomplished only by the total immolation of self. United with Mary, Mediatrix of all Graces, we will carry His Love into the lives of others. Now is the final battle for souls. Mary Mediatrix, the Immaculate Conception, and all those consecrated to her Immaculate Heart will be the heel which crushes the serpent’s head. The Miraculous Medal is a physical shield in this battle which proclaims her victory and each one who wears this Medal is protected by her powerful intercession. Let us sacrifice and labor to reach all souls with this precious gift of the Most Blessed Trinity: the Medal of Our Lady’s Immaculate Conception. Love watcheth and sleeping slumbereth not. When weary, it is not tired; when straightened, it is not constrained; when frightened, it is not disturbed, but like a vivid flame and a burning torch, it mounteth upward and securely passeth through all! United with Mary, let us go forward and love, for Love Alone Matters! Today I send you the first part of the pictures from the members of the Living Rosary Association of Saint Philomena (ULRA) in the Ukraine. The center of the Living Rosary and some Benefactors painted the icon of the saint Philomena and we equip the icon with the some materials of the ULRA and the people. The ULRA devoted members take the icon with the materials to the village Gorohlyna and the icon attract the folks and they pray in front of the icon and many become new members of the ULRA. I have many wonderful testimonies which i am going to send you tomorrow with the prayers and respect. Thank the holy spirit with me for assisting me to get time again for St. Mary, my mother and as well as my sister, St. Philomena. What touched me was that you remembered me on Marian feast days in particular, i was so delighted. I felt, i have another home. Despite the toughness of the year, i never failed to introduce St. Philomena and the decades to people, especially, the youth. Most members of the Universal Living Rosary Association of Saint Philomena (ULRA) are the youth and some from the hospital where our chaplain Sister Aquinata works. Mrs. L. MaKhumalo Hadebe is not a Catholic but a Christian. She is a staunch devoted follower of St. Philomena. I told her about this Wonder Worker and she fell in love with her. She tells me that the picture of St. Philomena is in her office at school, home and car. Before she goes to bed, she says a prayer to St. Philomena. We went and I saw with my own eyes MaKhumalo sharing the gift from Philomena with that needy soul. I am still shocked with what MaKhumalo did and more amazed with quick response of St Philomena. Now, I really believe that Catholic saints are for the universal salvation. If we Catholics can talk to St. Philomena in such faith, we can transform the world in a day. Thanks on her behalf to St Philomena.